Photo Credit: Durango Mountain Resort. Sleigh bells ring…are you listening? Yes, Christmas is over, and yes, you’re probably sick of that song. But winter will be in full swing for months to come, and there’s no better time to enjoy the snow in the San Juan mountains — including an old-fashioned sleigh ride in Durango. For the past 30 years, Rapp Corral has been offering horse-drawn sleigh rides. With five different sleighs — from a cozy, two-person flyer to a 10-person sleigh — Rapp Corral can handle groups of almost any size. The corral is about 17 miles north of the Durango Quality Inn on U.S. Highway 550. Each sleigh ride lasts about 45 minutes as “big boy” horses pull guests about 3 miles through the snow-covered Hermosa Cliff and Haviland Lake country in the San Juan National Forest. The experience also includes hot cocoa and a camp fire to warm up. 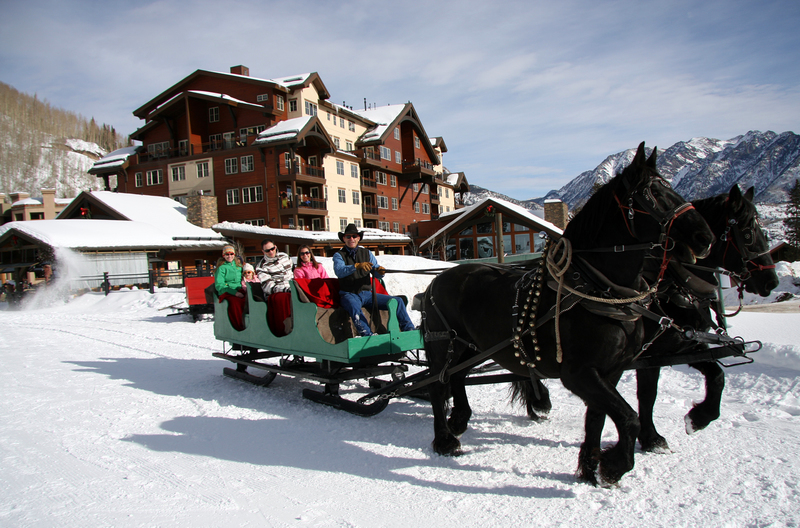 Sleigh rides are typically available through the end of February. Book your sleigh ride online or call 970-247-8454. Every evening throughout the winter, Buck’s Livery offers sleigh rides that start at Durango Mountain Resort, which is about 30 minutes north of Durango. Belgian and Percheron draft horses pull sleighs of 10 to 12 people during a slope-side sleigh ride. Rides are available at 4 p.m., 5 p.m., and 6 p.m., and reservations are required. For more information, call 970-385-2110. Buck’s Livery is located across from the Durango Mountain Resort entrance on U.S. Highway 550. Note: Outlaw Tours is not offering sleigh rides this year, but they will be offering them again next year, according to the company. So, while you’re visiting Durango for all your winter/snow/cold-weather activities, stay warm and cozy with us at the Durango Quality Inn. Book your room today! Next up on the blog? Snowmobiling. Stay tuned!